How can an ISP both lose and win in top 10 rankings? By placing more than once! Comcast got pushed out of first place by AS 46475 LIMESTONENETWORKS and AS 21788 NOC in the November 2011 Monthly U.S. SpamRankings.net from CBL volume. AS 20214 COMCAST-20214 did spam a third less (1,503,173 spam messages) than last month (2,193,898), but it was the spontaneous spam spewing of the two top place newcomers that pushed it down to third place. Yet Comcast really won the month. It took 4 of the top 10 (places 3, 6, 7, and 10), which is twice as many as last time, and accounted for 30.29% of top 10 spam spewed, up from 23.9% last time. That percentage beats either of the top two this time. In many developing countries, the absence of surface-based air pollution sensors makes it difficult, and in some cases impossible, to get even a rough estimate of the abundance of a subcategory of airborne particles that epidemiologists suspect contributes to millions of premature deaths each year. The problematic particles, called fine particulate matter (PM2.5), are 2.5 micrometers or less in diameter, about a tenth the fraction of human hair. These small particles can get past the body’s normal defenses and penetrate deep into the lungs. 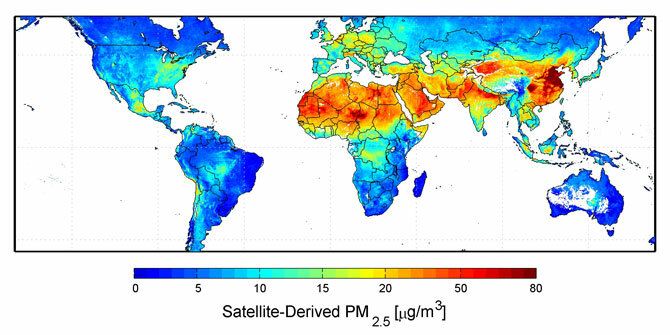 Global satellite-derived map of PM2.5 averaged over 2001-2006. However, the view got a bit clearer this summer with the publication of the first long-term global map of PM2.5 in a recent issue of Environmental Health Perspectives. Canadian researchers Aaron van Donkelaar and Randall Martin at Dalhousie University, Halifax, Nova Scotia, Canada, created the map by blending total-column aerosol amount measurements from two NASA satellite instruments with information about the vertical distribution of aerosols from a computer model. Here's why to look at more than one spam data source: according to the PSBL volume data for November 2011, Cleveland Clinic's AS 22093 CCF-NETWORK spewed more than a hundred spam messages a day on multiple days, while CBL volume data showed Cleveland Clinic with only 42 spam messages for the entire month. Apparently PSBL's spamtraps happened to be in the path of this CCF spam. Now a couple of hundred spam messages a day isn't much by world organization standards, but compared to what we'd all like to see from medical organizations (zero), it's a lot. Also compared to the other medical institutions in the same rankings from the same data, the pie chart looks like Pac Man and the bar graph looks like a hockey stick. Maybe Cleveland Clinic didn't get the memo after all.